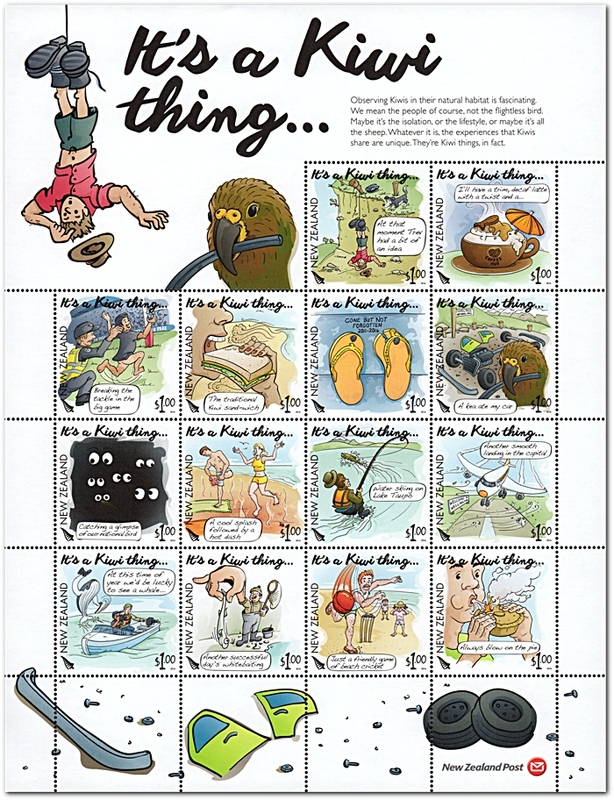 A post celebrating the quintessentially quirky Kiwi things we do with NZ Post's latest Kiwiana-themed stamp issue - It’s a Kiwi Thing. 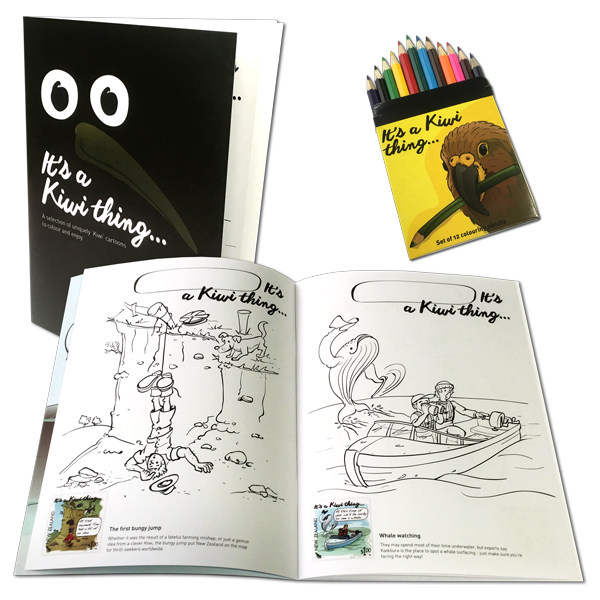 From the adrenaline-charged thrill of a bungee jump with nothing more than a rubber band around your ankles to the perilous dangers of hot mince-pie handling, it’s these Kiwi things that make us who we are. The First Bungy Jump. Complicated Coffee. 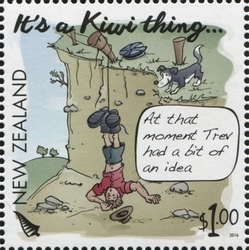 "At that moment Trev had a bit of an idea." 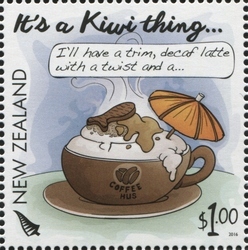 "I'll have a trim decaf latte with a twist and a ..."
The world famous bungee-jump was perfected in New Zealand and quickly spread around the world. The name Trev is often used to portrayal an ordinary bloke, maybe from the country, maybe not the smartest guy on the block. Kiwi's have taken to the cafe scene with most cafes crowded on weekends. Coffee, the original black or flat white has taken on a large variety of types, many lovingly made by coffee-making experts. Customers have come to expect good coffee as part of their dining experience. The Infamous Streaker. Sandy Sandwiches. "Breaking the tackle in the big game." 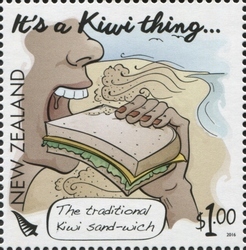 "The traditional Kiwi sand-wich." The not so dignified streaker running across Eden Park in the middle of a rugby or cricket game. First, it was taken as a joke but these days authorities see streaking as a distraction to the game and those caught are often handed over to the police. What to that for a picnic at the beach, Cooked chicken drumsticks and sandwiches. They are quick to make, carry easy in the chilli bin and always go down well, And who hasn't 'enjoyed' that crunch of sand in their sandwiches at the beach? "Gone but not forgotten 2011 - 2014" "A Kea ate my car." The faithful jandals, the chosen summer footwear of most of us at one time or another. Made of tough plastic, these days mass-produced in countries such as China or India, It's my guess that you'll find at least one pair in most houses in New Zealand. 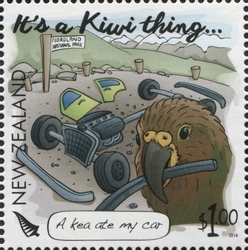 Many cars, left unattended, have been badly damaged by Kea attack. Maybe not as extensively as in the cartoon but they have been known to strip out the sealing around windows, and tear at other items such as mirrors, and lights. If they can gain access to a vehicle then they can totally destroy the interior seats and finishings. 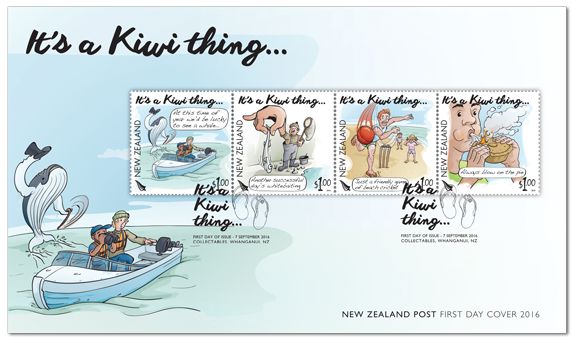 Spotting a Kiwi. The Hot Sand Dash. "Catching a glimpse of our nocturnal bird." 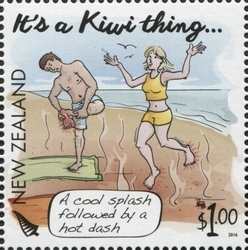 "A cool splash followed by a hot dash." 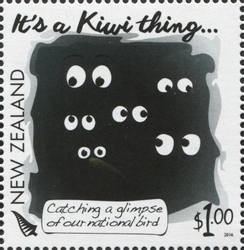 As said in the cartoon, kiwis are nocturnal birds so kiwi houses have bright lights that come on during our night and moonlit lights during our day. Even though, to walk into a kiwi house on a bright summer day, it takes some time for your eyes to adjust. The sand during the summer gets hot, particularly the iron sand of the Western Coast beaches. People have been known to get badly burnt exposing their feet to hot sand but somehow that gap from the edge of the wet sand to your towel has to be crossed. Trout Fishing. Landing in Wellington. 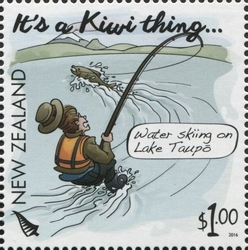 "Water skiing on Lake Taupo." 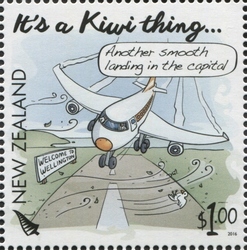 "Another smooth landing in the capital." Trout fishing is popular in the lakes of the central North Island but I'm not sure there are any trout quite as big as that one! Windy Wellington, on the shores of Cook Strait, the gap between the two main islands of New Zealand. The airport is on the exposed south coast and aircraft on final approach are often seen getting thrown around by the wind. 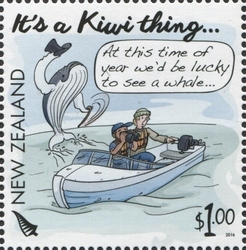 "At this time of year, we'd be lucky to see a whale ..." "Another successful day's white baiting." Whale watching along the upper east coast of the South Island. There is the whale behind them putting on the great show. The tiny little river fish that makes a 'run' to the ocean before returning to their own river to breed. 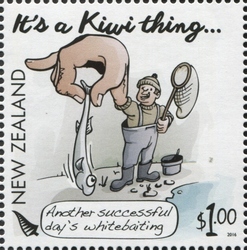 They are popular with many people and make great whitebait fritters. Beach Cricket. A Nation of Pie Lovers. "Just a friendly game of beach cricket." "Always blow on the pie." 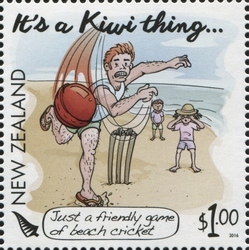 Beach cricket is popular in the summer which is also the cricket season in New Zealand. Often it's just a friendly bit of fun, who cares who is winning but sometimes as shown in the cartoon guys can get carried away. 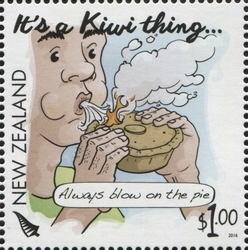 New Zealanders love their meat pies, a favourite meal for lunch. A pie that has been sitting in the pie warmer for a few hours can get mighty hot, particularly the juice inside so it is a good idea to blow on the pie to try and cool it a bit before eating. 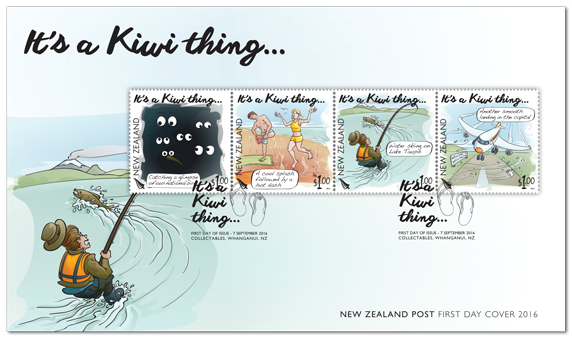 Since it would be impossible to fit the full sheet or even the fourteen stamps onto a cover, a set of three First Day Covers was created to be released with the full sheet. First Day Cover 1 - 7 September 2016. First Day Cover 2 - 7 September 2016. 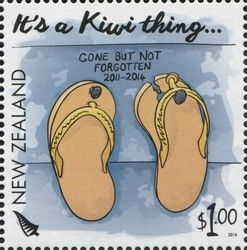 First Day Cover 3 - 7 September 2016. An extra added to this issue was a children's colouring book that came with a set of colouring pencils. 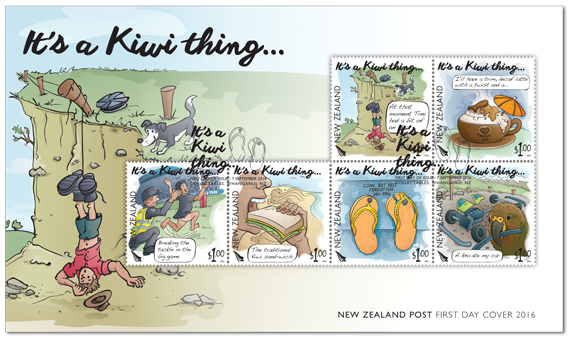 Unless stocks are exhausted earlier, these stamps will remain on sale until 6 September 2018. First day covers will remain on sale until 1 September 20156 November 2016.